Every morning I get an email from Zillow that recommends homes for sale in Harvey, Illinois. The emails are usually striking, but the one I got in mid-March was more dismal than usual. Not only were the property tax rates confiscatory – all of them were higher than 8 percent – but the home values were depressingly low, providing evidence that places like Harvey no longer function for the residents that live there. 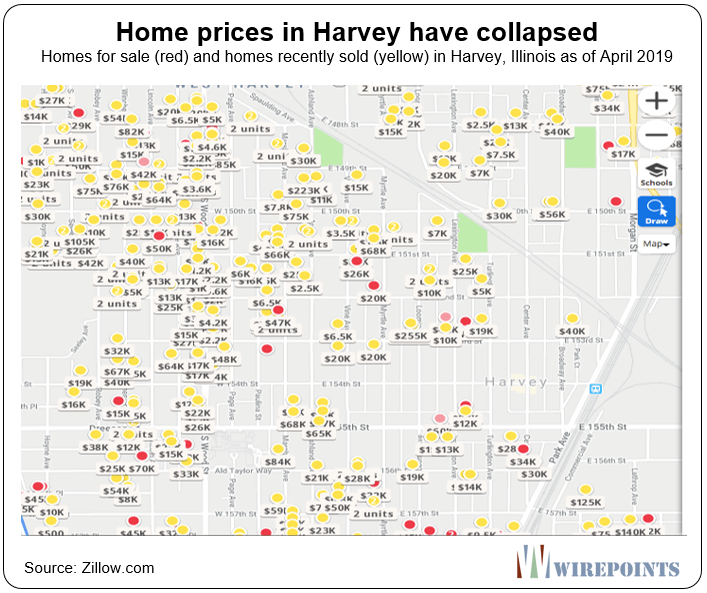 If you don’t know Harvey, it’s ground zero for the fiscal and human hardship that’s hitting many parts of Chicago’s south suburbs. Yes, Harvey’s brand of corruption might be worse than in other parts of the state. It certainly has done its part to ruin what few assets the city had left. But the path Harvey is on isn’t much different from those in other south suburban communities, from Chicago Heights to Matteson to Park Forest. Harvey is just ahead of the curve. Deserted homes, empty lots, ghost strip malls and abandoned manufacturing sites are all part of the mess state and local politicians have made of what was once a thriving middle/working class area. Many will be quick to blame the locals and the nation’s manufacturing woes as the cause of the south suburbs’ troubles. For sure, those contributed. But the real problem is the failed public policies the state has imposed – the same ones that are hurting municipalities across the state. For decades, the property tax burden of escaping manufacturers and commercial businesses has been pushed onto residential homeowners. At the same time, state mandates from investment-crushing prevailing wage requirements to unaffordable public pension benefits to overly-restrictive collective bargaining rules have driven these communities into decline. It doesn’t help that these communities are so close to the Indiana border, a AAA-rated state that pursues policies far more friendly to residents and businesses alike. More attention needs to be given to the plight of the people of Chicago’s Southland and the problems they face. Without a reversal of the state’s failed policies, most of those cities will continue to hemorrhage people and descend further into what can only be described as chaos. I subscribed to the Zillow email about a year ago after I struck up a conversation with a young Harvey resident named Durrell Parchman, a machinery and forklift operator in the area. I ran into him at a Subway restaurant the day then-state Rep. Jeanne Ives and I held a joint press conference in Harvey to bring attention to the fiscal crisis hitting Chicago’s south suburbs. Harvey had just announced it was firing more than 40 public safety workers after the city was forced by the state to properly fund its local pension plans. The state’s actions proved Harvey could no longer afford to pay its current workers and its pension obligations at the same time. Unsurprisingly, the crisis didn’t get much coverage, even though many cities in the state would face similar problems if they were forced to fund the true costs of their pension debts. The entire area has been largely written off by Illinois’ political elite and by much of the media. Durrell told me that his mother, a retired nurse, and his father, a truck driver, had already fled Harvey and moved to Mississippi. But Durrell and his sister were sticking it out in their parents’ home on Lexington Avenue for a bit longer. 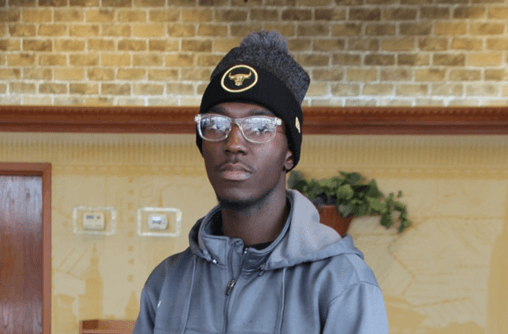 His parents were hoping to sell their house for $35,000, but Durrell thought they were too optimistic. He said he didn’t think they’d get more than $7,000 for it. His comments caused me to dig deeper and I signed up for the Zillow email to follow things in Harvey more closely. I’d been in Harvey and the other South Cook communities enough to know how depressed things were. But homes selling for $7,000? As it turns out, Durrell was right to be pessimistic. The below Zillow map shows all the recent sales (yellow dots) and homes for sale (red) in Harvey. Look closely and you’ll find plenty of homes sold for just $15,000 or $10,000 or $7,000 or $2,500. The prices look more like those of a used car sales lot than from a residential area people call home. You’d be mistaken to think this is just a Harvey issue. The communities across South Cook like Dolton, Riverdale, Dixmoor and Chicago Heights – and pockets in the other, larger south suburbs of Southland – have properties worth just five or even four figures, most accompanied by sky high effective property tax rates. All this is a massive disruption for the ordinary Illinoisans that live there and for those who’ve been forced to flee. It’s destroyed people’s equity in their homes and perhaps wiped out their savings. Many neighborhoods are simply no longer functional. A lot of hay is being made about the current reassessment of properties going on in Cook County, particularly about its impact on the Southland area. The county’s new assessor, I’ve been told, is eager to correct the “imbalances” that have done harm to those communities. But while getting the assessments right is important, it’s won’t fix the real problems. Properly valuing properties will do little to fix the decay that’s built up over the past three decades. Instead, it will take fundamental reforms at the state and county level if communities in South Cook are to have a chance at turning around – reforms that end the many state mandates that prevent localities from bringing costs in line with what their residents can afford. Only then will local communities have the power to attract people and businesses once again. Until all that happens, South Cook will continue its decline. Durrell said the street he lives on was one of the most violent when he was growing up. I asked him why he still lived there, did crime go down? Yes, he responded. But only because many of the homes have been abandoned or torn down. Like so many of the residents who remain, Durrell isn’t optimistic about the future. He’ll tough it out, but will stay only as long as he has to. “It’s depressing. I’m just glad I’m not depressed.” he said to me. The Palatine-Schaumburg District 211 teachers’ contract in place is very generous to the teachers. I think everyone but the floor sweeper now makes over $100K. That’s good for the teachers, except that there will be less and less students to teach as more and more families move out. On may 3rd–57,000 cc property’s are up for sale on cc property tax/scavenger sale from those who cant pay or are walking away from there homes. Horrific–pappas is only pols sounding the alarm. Where are all the fake sjw’s? But do these people keep voting Democrat?? I assume this was a rhetorical question. The SouthLand and south-side of Chicago will continue to decline. Most of the media and the movers and shakers politically and socially do not live here. Take a close look from South Holland to Tinley Park to Oak Lawn to Oak Forest: this is your future. This is what happens when corruption is the rule and local school boards get what they want each and every year, browbeating and shaming residents to approve more and more for mostly underperforming academic results.